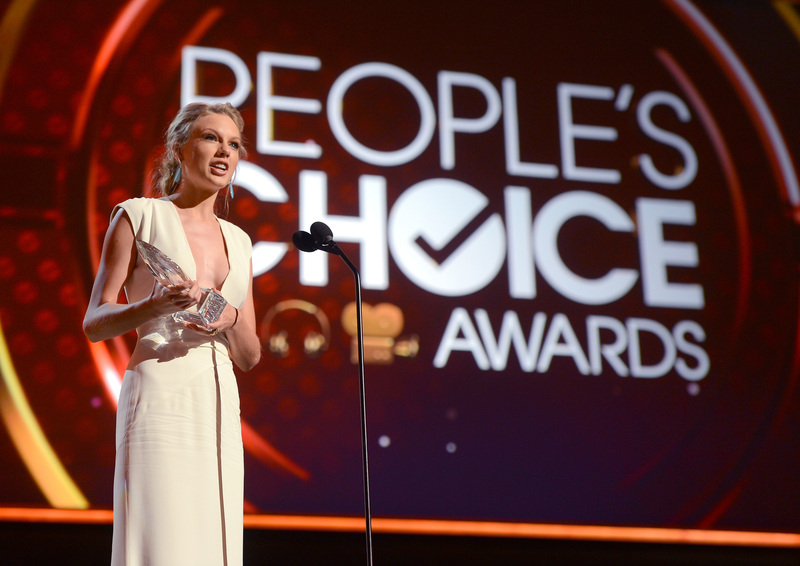 January 9: The People’s Choice Awards 2013. Taylor had three nominations: Favorite Female Artist, Favorite Country Artist and Favorite Song for We Are Never Ever Getting Back Together. Update! She won for Favorite Country Artist. January 13: The Golden Globes air on NBC. Taylor Swift and the Civil Wars are nominated for Original Song for Safe and Sound from the motion picture The Hunger Games. Taylor will be in attendance. Update! She didn’t win. February 10: The 55th Grammy Awards air live on CBS. Taylor has three nominations: Record of the Year for We Are Never Ever Getting Back Together, Best Country Duo/Group Performance with the Civil Wars and Best Song Written For Visual Media for Safe and Sound with the Civil Wars and T. Bone Burnett. She is scheduled to perform. Update! She won for Best Song Written For Visual Media for Safe and Sound. February 20: Taylor is nominated for International Female Solo Artist for the BRIT Awards 2013. She will be performing. February 22: Taylor Swift tapes a performance for Let’s Dance For Comic Relief to be aired on March 9nd. March 13: The music video for 22 will get a 30 second preview on Good Morning America. It will be available online at ABC News and Good Morning America at 8:30 a.m. ET. Big Machine Records will release the video to all outlets at 11:30 a.m. ET on the same day. March 13: The RED Tour has begun! March 13 and 14: The Red Tour starts at CenturyLink Center Omaha in Omaha, Nebraska. March 18 and 19: The Red Tour at Scottrade Center in St. Louis, Missouri. March 22: The Red Tour at Time Warner Cable Arena in Charlotte, North Carolina. March 23: The Red Tour at Colonial Life Arena in Columbia, South Carolina. March 25: Fan voting starts for the 48th ACM Awards Entertainer of the Year. March 27, 28 and 29: The Red Tour at Prudential Center in Newark, New Jersey. April 7: The 48th ACM Awards air from Las Vegas, Nevada at 8pm ET/PT on CBS. April 8: ACM Presents: Tim McGraw’s Superstar Summer Night at the MGM Grand Hotel in Las Vegas, NV. April 10: The Red Tour at American Airlines Arena in Miami, Florida. April 11 and 12: The Red Tour at Amway Center in Orlando, Florida. April 18 and 19: The Red Tour at Philips Arena in Atlanta, Georgia. April 20: The Red Tour at Tampa Bay Times Forum in Tampa, Florida. April 25: The Red Tour at Quicken Loans Arena in Cleveland, Ohio. April 26: The Red Tour at Bankers Life Fieldhouse in Indianapolis, Indiana. April 27: The Red Tour at Rupp Arena in Lexington, Kentucky. May 1: The Civil Wars will share some exciting news according to their Twitter. Update! They’re working on their next self-titled album. May 4: The Red Tour at Ford Field in Detroit, Michigan. May 7: The Red Tour at KFC Yum Center in Louisville, Kentucky. May 8: The Red Tour at Nationwide Arena in Columbus, Ohio. May 11 and 12: The Red Tour at Verizon Center in Washington, D.C.
May 16: The Red Tour at Houston Toyota Center in Houston, Texas. May 19: The 2013 Billboard Music Awards will be broadcast live on ABC at 8/7c from the MGM Grand Garden Arena in Las Vegas. Taylor performs. Update! She won 8 awards including Billboard Artist of the Year. May 19: ACM Presents: Tim McGraw’s Superstar Summer Night airs on CBS at 9/8c. Recorded at the MGM Grand Hotel in Las Vegas, NV back on April 9. May 21: The Red Tour at Frank Erwin Center in Austin, Texas. May 22: The Red Tour at AT&T Center in San Antonio, Texas. May 25: The Red Tour at Cowboys Stadium in Arlington, Texas. May 28 and 29: The Red Tour at Jobing.com Arena in Glendale, Arizona. June 1: The Red Tour at EnergySolutions Arena in Salt Lake City, Utah. June 2: The Red Tour at Pepsi Center in Denver, Colorado. June 5: The 2013 CMT Music Awards. June 6 – 9: The 2013 CMA Music Festival takes place in Nashville, TN. Taylor Swift performs at LP Field on June 6. June 8: Taylor Swift and Ed Sheeran play on the live finale of Britain’s Got Talent, according to Tellymix. June 9: Taylor will perform at Capital FM’s Summertime Ball 2013. June 14 & 15: The Red Tour at Rogers Centre in Toronto, Ontario. June 16: The Enchantress is nominated for the 2013 MuchMusic Video Awards. She won for Your Fave International Artist/Group. She introduced Ed Sheeran’s performance. June 22: The Red Tour at Investors Group Field in Winnipeg, Manitoba. June 25 & 26: The Red Tour at Rexall Place in Edmonton, Alberta. June 29: The Red Tour at BC Place in Vancouver, B.C. June 30: David Cook performs with Morgan James at the Montreal Jazz Festival. July 1: David Cook performs with Morgan James at the Montreal Jazz Festival. July 6: The Red Tour at Heinz Field in Pittsburgh, Pennsylvania. July 13: The Red Tour at Metlife Stadium in East Rutherford, New Jersey. July 19 & 20: The Red Tour at Lincoln Financial Field in Philadelphia, Pennsylvania. July 26 and 27: The Red Tour at Gillette Stadium in Foxborough, Massachusetts. Aug. 1: The Red Tour at Wells Fargo Arena in Des Moines, Iowa. Aug. 2 and 3: The Red Tour at Sprint Center in Kansas City, Missouri. Aug. 6: The Red Tour at Intrust Bank Arena in Wichita, Kansas. Aug. 7: The Red Tour at BOK Center in Tulsa, Oklahoma. Aug. 10: The Red Tour at Soldier Field in Chicago, Illinois. August 11: Taylor Swift has 7 nominations for the Teen Choice Awards (8:00-10:00 PM ET live/PT tape-delayed) on FOX. Update! She won Choice Female Country Artistand Choice Country Song for ”We Are Never Ever Getting Back Together”. August 12: CMA Music Festival: Country’s Night To Rock hosted by Little Big Town. Taylor Swift performs. Aug. 15: The Red Tour at Valley View Casino Center (formerly San Diego Sports Arena) in San Diego, California. Aug. 19 and 20: The Red Tour at Staples Center in Los Angeles, California. Aug 23 and 24: The Red Tour at Staples Center in Los Angeles, California. Aug 25: 2013 MTV VMA. Update! T-Swizzle won Best Female Video for I Knew You Were Trouble. Aug. 27: The Red Tour in Sacramento, California. Aug. 30: The Red Tour at Rose Quarter in Portland, Oregon. Aug. 31: The Red Tour at Tacoma Dome in Tacoma, Washington. Sept. 6: The Red Tour at Fargodome in Fargo, North Dakota. Sept. 7 and 8: The Red Tour at XCel Energy Center in St. Paul, Minnesota. Sept. 12: The Red Tour at Greensboro Coliseum Complex in Greensboro, North Carolina. Sept. 13: The Red Tour at PNC Arena in Raleigh, North Carolina. Sept. 14: The Red Tour at John Paul Jones Arena in Charlottesville, Virginia. September 19: The Red Tour at Bridgestone Arena in Nashville, Tennessee. September 20: The Red Tour at Bridgestone Arena in Nashville, Tennessee. September 21: The Red Tour Grand Finale at Bridgestone Arena in Nashville, Tennessee. November 3: Taylor Swift and Gary Lightbody perform “The Last Time” on X Factor UK. November 3: The YouTube Music Awards. Taylor wins YouTube Phenomenon for I Knew You Were Trouble. November 5: The final 2014 People’s Choice nominations are announced. Taylor Swift is nominated for Country Artist of the Year. November 6: The 47th CMA Awards at the Bridgestone Arena in Nashville, TN. Taylor is scheduled to perform. She received the Pinnacle Award and won both Musical Event of the Year and Music Video of the Year for ”Highway Don’t Care” with Tim McGraw and Keith Urban. November 7: Mallary Hope opens for Charlie Daniels at the Municipal Auditorium in Greenville, TX. Click here for ticket information. November 10: It’s the four year anniversary of this blog thing! November 14: The 2013 Billboard Touring Awards take place at the Roosevelt Hotel in New York City, NY. Update! Taylor Swift’s RED Tour won for the Top Package Award. November 24: The 2013 American Music Awards air live. Taylor won for: Artist of the Year, Favorite Female Artist – Pop/Rock, Favorite Female Artist – Country and Favorite Album – Country for RED. November 26: Taylor Swift performed at the Centrepoint Winter Whites Gala at Kensington Palace in London, UK. November 29: The RED Tour at Vector Arena in Auckland, New Zealand. November 30: The RED Tour at Vector Arena in Auckland, New Zealand. December 1: The RED Tour at Vector Arena in Auckland, New Zealand. December 4: The RED Tour at Allianz Stadium in Sydney, Australia. December 10: The 2013 American Country Awards on FOX. Taylor Swift won for World Wide Artist of the Year, Single of the Year: Vocal Collaboration: “Highway Don’t Care,” with Tim McGraw and Keith Urban, Music Video of the Year: Group or Collaboration: “Highway Don’t Care,” with Tim McGraw and Keith Urban. December 10: Victoria’s Secret Fashion Show airs on CBS. Taylor performed on the show, recorded on November 13. December 13: Happy Birthday, Sparkly Dressed!